There has been of late, a local company (both Malaysia and Singapore) that specialises in blog advertising where they get fellow bloggers to sign up as part of their network. Thereafter, pushing banner ads down the channel to the various blogs from their advertising accounts. The good thing about it is that the bloggers get paid to put up these banner ads and the revenue earned depends on the traffic to the respective blog sites. Quite a good deal considering the fact that the blogger doesn't have to do anything, except paste a few lines of codes into their skin script. After that, just take it easy and let the money trickle in. I have been approached by a few commercial entities in the past to advertise on my blog but none has offered anything that would even mildly raised an eyebrow. Then again, it is not like I have a fantabulous blog to begin with. Anyway, I don't have a beef with these banner ads. I was told that the ads were sent to you ahead of the roll-out date and that you do have a choice to decide if you want to put it up or not. In a way, I am happy to hear that participating bloggers do have a say in this partnership cause I really hate to see a "Eat MaLing Luncheon Meat!" banner ad on my Muslim friend's blog. Then there is the big ticket item. The advertorial. Where bloggers are invited by the blog advertising company to write something about the featured ad. In return, a nice little something for the effort goes into the blogger's kitty. Initially, I hadn't really taken much noticed about these reviews (which were nothing but positive) and it's probably due to the fact that I too, regard the advertised product in question, positively too. It was only until now where the advertised product is that of a credit card from a certain bank offering no minimum income entry requirement and a credit limit of SGD 500.00. I personally do not agree with this product as it risks putting people, without a stable financial foundation, into debt. That's when I realised that none of the reviews expressed these objections. Don't get me wrong here for I am not saying that this is a bad product as this may be a useful tool for a certain market segment. However, this is just as dangerous a product for someone who do not fully understand the mechanism of this credit facility. Coming back, one thing I noticed about these blogs with the credit cards banner ads, the reviews are all positive. All the questionables are either side-stepped or ignored. Coincidence? Don't answer that. It's rhetoric. Anyway, I think it is pretty smart of them to think of using average-joes'/janes' blog entries as a way of indirect publicity in the guise of word-of-mouth public relations. 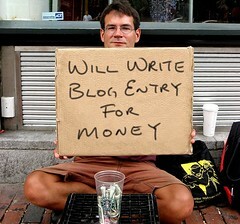 Still, I think it would be better if the blogger were to make known that the entry is an advertorial? Granted that most would have sniffed the advertorial for a mile away but as long as one unsuspecting reader think otherwise, then we have one person being misled already. Perhaps it is just me to think that my blog is a place where I jot down my inner thoughts and memories. Say what I feel, express what we think. Somehow this idealistic (or perhaps naive) part of me felt desecrated as the sanctuary is now compromised by money. perhaps simplistic, but the ol' credit card is definitely a contributing factor as to why so many British are in debt. It was a surprise to me to find out that 'credit limit' is viewed as 'cash in hand' as opposed to 'credit'. Ie if the credit card comes with 8000 quid credit limit, people think they have 8000 quid in their bank and therefore spend till that! alot of them conveniently forget that they'll have to pay back at some point... and at some considerable cost. Hey, I've written something about the Citi Clear Card and it's in my draft! Stay tuned ok. But it's about how I feel about the card lah, not advertorials per se..
Pam: Accrording to our friend Eddie who used to work in the bank's call centre, those who pay the monthly minimum and roll over are classified as Grade A customers as they generate the most revenue. You and I who spend quite a bit but always pay on time at due date are merely Grade C only. I have nothing against going into debt if the interest rate is reasonable. I have an overdraft facility at Prime+1% which I thought was ok. But 24% for regular card and 60% for these unsecured cards is plain daylight robbery! hitomi: Yah. But hor, I will tell you more offline, then you will understand why. Zhebin: Me too. Stay tuned for my following piece due out on Monday. Cowboy did mention his is an advertorial. And I think so did nadnut. But I digress. I personally think it's ok only if the person has some sort of an income. I remembered the thrill when I first got my debit card. So swanky leh. But that one couldn't buy online stuff. Then came the UOB Mini Debit. And I use it more often than my credit cards. So that I know I won't be greeted with a horror IOU next month. Sometimes I still do whip out the Clear Card to earn some points, just for the heck of it. nadnut and chocogal: I think this card is ok for you guys on account of the fact that both of you are working already. I just think that a student without income should not be given a card independently when the option of a supplementary card from an adult is available. That way, it would be on the onus of the principal adult to watch and control the spending of his underling. Barffie: I wasn't writing with them in mind and surely you would agree that there are way more bloggers out there gushing about the card. Again, I have to agree with you that I am ok with it as long as the applicant has a source of income. having a source of income can NOT be equated as having financial sense. or else how come so many ppl r in debt? since the prerequisite of owning a credit card means u need to have some sort of mininum income..
financial sensibility is the concept we need to instil in ppl who r using credit cards, not whether some segment of the society without income shld have it or not. how bad a debt u can get into with 500 credit limit anyways? thye might juz want to use it to buy some crap online sometimes. naeboo: Yes in a way I agree with you but having an income is definitely having more sense than one without. Perhaps a lesser evil? We definitely need to educate them that a credit card is a convenience as far as payment is concerned but never a loan facility.